Oil spills can have detrimental impacts on entire ecosystems. According to a new study published in the journal Microbiome, a group of bacteria trawled from the depths of the Challenger Deep can not only survive its extreme conditions, but also chomp on hydrocarbon molecules found in everyday crude oil and natural gas. Oil-eating bacteria like these are also found on the ocean's surface, and helped degrade much of the oily refuse that spilled into the Gulf of Mexico after the 2010 Deepwater Horizon disaster. The scientists think these microbial deep ocean oil-eaters can also be used to clean up surface oil spills. 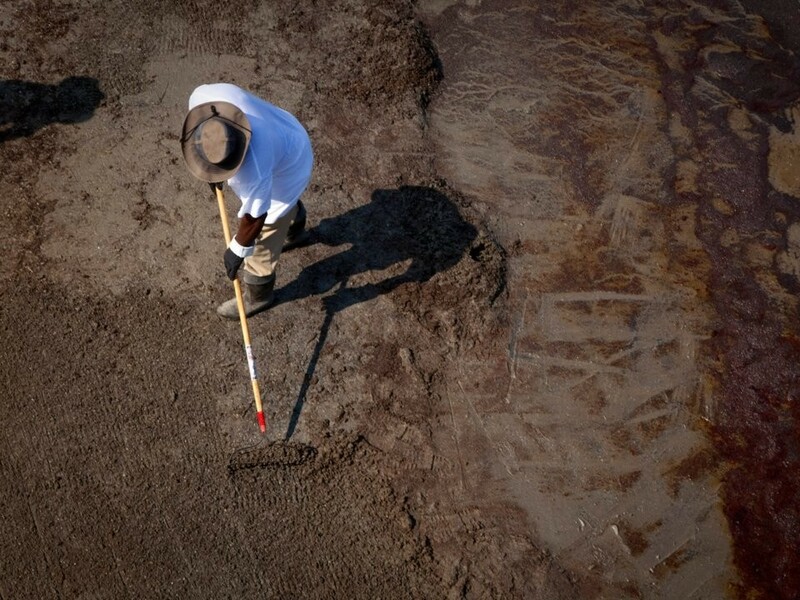 A contract worker rakes oil from the Deepwater Horizon oil spill off a beach in Grand Isle, Louisiana. Challenger Deep is "inhospitable to nearly every organism on the planet. Cold and completely dark. What is most extreme is the intense water pressure which would crush most organisms in a fraction of a second," Jonathan Todd, a biologist from University of East Anglia in the UK and a co-author on the study, told Business Insider. "How the microorganisms survive this environment is still a mystery and this is another of our key future research questions," he added. Collecting samples from the crushing depths of the Challenger Deep is no easy feat. To date, only a few expeditions have investigated the denizens that make their homes 7 miles below the ocean's surface (sorry Jason Statham fans, no live Megaladons have been discovered as of yet). 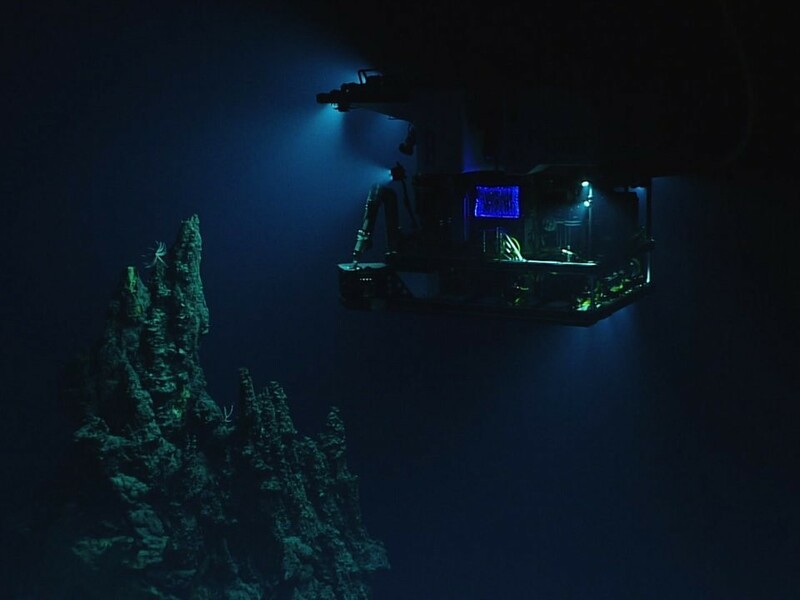 A remotely operated vehicle Deep Discoverer surveys a 46-foot hydrothermal chimney during a deepwater exploration of the Marianas Trench. In order to get samples, researchers dropped bottles and corers into the ocean and sampled water and sediment at different depths in the Mariana Trench. "Just think about the size and weight of the cable required to fish at depths of more than 10 kilometers [or 6 miles]," Todd said. Todd and his team aren't sure yet why that's the case. "It may be that there is a higher proportion of hydrocarbons compared to other nutrient sources in the Mariana Trench, which supports this particularly large population," Todd said. These hydrocarbons could accumulate within the trench due to its unique topography, he added. The study authors think the hydrocarbon nutrients could be the secret to these bacteria's success in the Challenger Deep's extreme environment, where pressures reach some 15,000 pounds per square inch — more than 1,000 times the pressure at sea level. Hydrocarbon-eating organisms have already been used to help degrade man-made oil spills. In 2010, the Deepwater Horizon spill off the coast of Louisiana poured some 200 million gallons of oil into the Gulf of Mexico. An area the size of Rhode Island was closed off from fishing, and local economies tanked. Several species of hydrocarbon-eating bacteria, like Alcanivorax borkumensis, feasted on the spilled oil, assisting with the disaster clean-up efforts. Alcanivorax was one of the types of bacteria that Todd and his group found in the Challenger Deep. Todd thinks it's possible the bacteria pulled from the Mariana Trench could similarly assist in oil spill clean-ups. When tested in the lab, these microorganisms from the ocean depths "very efficiently consumed" the types of hydrocarbons that surface bacteria like Alcanivorax borkumensis degraded after the 2010 Gulf oil spill. While Todd said further work is required "to test the potential of these novel bacteria," the team believes that the hydrocarbon-eating bacteria from the bottom of the ocean could consume any oil found on the surface.